Galveston Island, Texas – The 2014 TWELVE Project returns the first weekend in October with two nights of live music and the public’s first opportunity to view the 2014 photos prior to their public auction. TWELVE, now in its fourth year, is giving 12 Texas musicians the opportunity to turn their creativity to photographing life behind the mic as well as participate in a newly formed concert series that runs from September through December at various island venues. Auction of the artist’s selected photo, and sales of concert tickets, will go towards the newly established TWELVE fund. Events begin Friday, October 3, at the 1892 Bishop’s Palace, 1402 Broadway, for an intimate performance with singer-songwriter Jamie Lin Wilson. In addition to the music, all 12 images will be available for public viewing prior to their October 11th auction. Tickets are $10 and doors open at 6 p.m. The music continues Saturday evening beginning at 7 p.m. at Smooth Tony’s, 415 9th St, with Waylon Payne and Houston blues legend Little Joe Washington. Tickets are $15 and available at www.twelvepeople.org. Money from ticket purchases will go toward the TWELVE Fund, which raises money for Galveston area youth in need of financial assistance in the arts. An artist of singular talent and restless creativity, Jamie Lin Wilson broke into the Texas country/folk scene as one of the lead vocalists of the Sidehill Gougers, later known as just the Gougers before the band gradually gave way to not only Wilson’s solo work but also her highest-profile-yet musical adventures with The Trishas, an all-female singer-songwriter band that has toured through some of the state and nation’s best venues. Scoring one of the best albums of 2012 with “High Wide & Handsome” and framing Wilson’s stunning originals in the context of sisterly collaboration and harmony, the Trishas have brought her career to new heights while still leaving room for solo gigs, guest spots on over a dozen albums by now, and song-swaps with like-minded artists all over Texas and beyond. Country singer/songwriter and actor Waylon Payne is the son of Jody Payne, longtime guitarist in Willie Nelson’s band, and country singer Sammi Smith; he was named after his godfather, Waylon Jennings. He began his career writing songs and playing with other musicians. Notably, he placed “Elvis” and “Sing ‘Til I Stop Crying” on Pat Green’s album Wave on Wave in 2003, also singing and playing guitar on the disc. He had already finished recording his own album, The Drifter, without a label deal and was playing with Nelson in New York when Green suggested he play the record for Green’s label, Republic/Universal. Payne was signed to the label, which released The Drifter on June 22, 2004. It attracted critical praise and was tapped by other artists for material. Django Walker put “Her (She’s Gone)” on his album Six Trips Around the World, and “The Bottom” was covered by both Keith Gattis, producer of The Drifter (on Big City Blues, for which Payne sang background vocals), and Charlie Robison (on Good Times). Payne, also an aspiring actor, was cast in the role of Jerry Lee Lewis in the Johnny Cash biopic Walk the Line, which opened in 2005. Payne’s appearance on the soundtrack album allowed him to share the Grammy Award won by the disc. With his hard-drinking and otherwise hard-living persona, it’s amazing that Little Joe Washington — the wildest of them all — is the last of the Third Ward guitar slingers alive. And not just alive, but apparently thriving. His energy on stage often puts many people four decades younger to shame. And until now, that liveliness has been pretty much all we’ve had to go on. Those of us who’ve seen Washington jump off his Schwinn and sit in at some random dive with whoever happened to be on the stage, or have heard one of the bootleg CDs or cassettes he hawks, can be forgiven for thinking of him as sort of a Sun Ra of the blues at best, and at worst, a court jester or out-and-out pest. The battered cowboy hat he always passes around even kind of looks like a jester’s motley, Texas-style, and his whiskey-fueled romps on guitar and Casio keyboards range from the sublime to the ridiculous, sometimes in the space of two or three bars. You thought there might be a genius in there somewhere, but as with the sayings of Yogi Berra, you were never sure if it was talent or folly. TWELVE is a nonprofit initiative fiscally sponsored by ARTSPIRE, a Program of New York Foundation for the Arts (NYFA). The program is one of the oldest, largest, most prestigious and artist friendly in the county. For additional information on TWELVE, please visit www.twelvepeople.org or contact Will Wright at 806-236-0715 or will@twelvepeople.org. Eilenberger Bakery Opens For The Holidays! Palestine- After a long, hot summer in East Texas Eilenberger Bakery, the oldest bakery in the Lone Star State, will reopen its doors to the public tomorrow in Historic Downtown Palestine! The bakery has been preparing all summer for the holidays and is excited about seeing familiar faces back in the store. Palestine residents have been waiting for this moment for several months to satisfy cravings that can only be met by the sugary sweet goodness of the historic bakery. Eilenberger Bakery has been tickling taste buds since 1898! Visit the historic bakery for a real taste of East Texas history! Crockett- It’s that time again!! 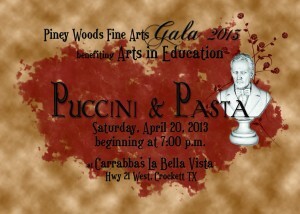 The annual Piney Woods Fine Arts Gala benefiting Arts in Education!! The theme for this year’s Gala is “Puccini & Pasta! !” There will be live entertainment, live & silent auctions, dinner, and more. It will be held at Carrabba’s La Bella Vista in Crockett on Saturday April 20, at 7:00pm. All proceeds from this event go to our Arts in Education programs benefiting the children of Houston and the surrounding counties. PALESTINE- The City of Palestine’s Historic Landmarks Commission has announced two properties that are recognized for their beautification efforts. Since 1994, the Palestine Historic Landmarks commission has been awarding recognition for the efforts made by owners to beautify and rehabilitate their property, a contribution that benefits the entire community. 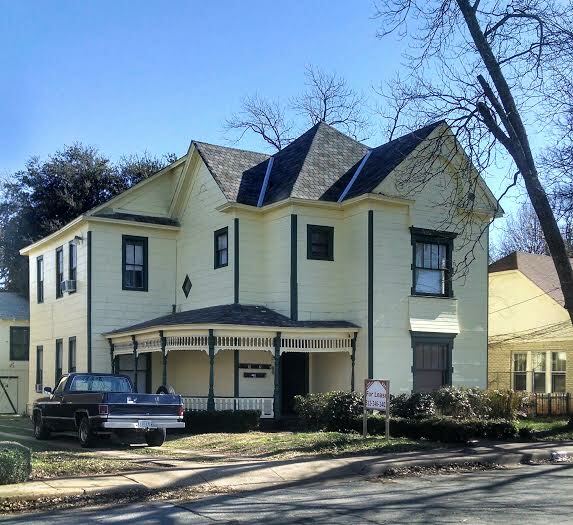 For the month of January the Historic Landmarks Commission singled out two properties that have recently been beautified and rehabilitated, and commend the owners on a job well done.